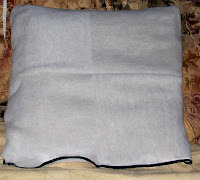 so, I did a new listing for my shop, http://pandys.etsy.com and in my head and in my living room, it's a GREAT item...a fleece throw that you can fold into a pillow. (I call it the Secret Stash Pillow/Throw) Keeps the couch neat. Well, trying to take pictures that showed what it was proved to be quite challenging. In fact, almost impossible!!!!! I am going to try again tomorrow to take pictures outside. It's supposed to be a nice, crisp, sunny fall day in New Hampshire. So, the question of the day is this.....how do you make oatmeal colored fleece look exciting and vibrant? Yeah. Tough question. Oh..pandy there is just some colors that do not photo well...maybe with some color around it! Lol..but this is from someone whose pictures are terrible! That is so hard. I'm sure it would look fabulous outside.